The breakfast event will include a short presentation to introduce the Northern Ireland Skills Barometer focussing on the needs of the Northern Ireland economy up to 2025. 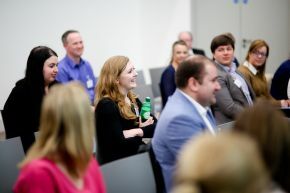 Attendees will be introduced to support for business growth offered at Ulster University and will include examples of innovative practice and workforce development. This event is free and is being hosted in partnership with PwC, sponsors for our 2016 Work Experience and Entrepreneurship week.